Sonia Leber and David Chesworth are two artists who have been collaborating since 1996 in the creation of a series of large-scale installation artworks, using sound, video, architecture and public participation, often utilising the human voice as a principal element. Their HD video works are influenced by the sound-based aspects of their practice as well as specific architectural and social settings. 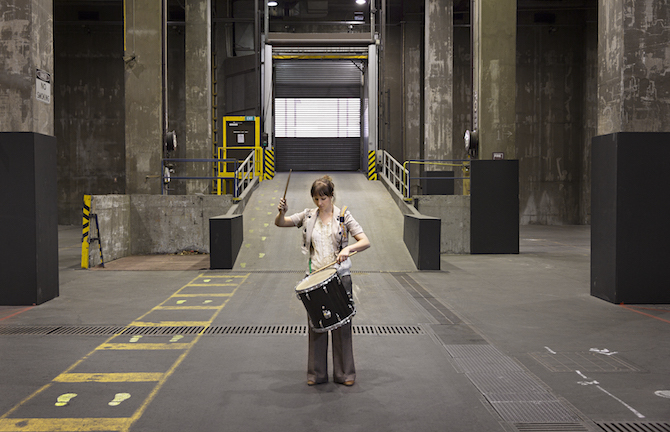 They are regularly commissioned to create site-specific sound installations for the public domain. Together and separately, Sonia and David have exhibited at Fehily Contemporary, Melbourne; Gridchinhall, Moscow; MONA FOMA, Hobart; Monash University Museum of Art, Melbourne; 56th Venice Biennale; 19th Biennale of Sydney; National Gallery of Victoria, Melbourne; and many more! Sonia Leber and David Chesworth, We Are Printers Too, 2013. Still image courtesy the artists.